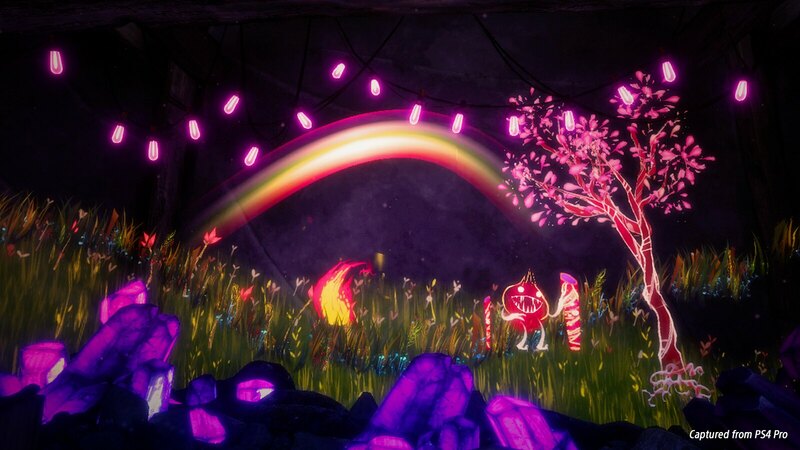 Concrete Genie, the second game from Pixelopus, is set to arrive on PlayStation 4 this autumn, and as revealed during State of Play it will have two PlayStation VR modes packed in. After playing its “VR Experience” mode at a San Francisco-hosted hands-on event, I came away with a newfound appreciation for the artistry on display from the small San Mateo-based studio. My demo began in a dark, stifled room built of brick and devoid of light, color, or life. After being equipped with a large, magical paintbrush and Ash’s book of memories, I used my PS Move controller to select a picture of grass from the book held in my left hand, then painted a row of the stuff across the of the wall in front of me. When I did so, a few lights strung along the ceiling lit up. At this point I realized these lights almost completely encircled the room I was standing in… a-ha, a goal to pursue! Every so often, after bringing more life to the room, an envelope would fly toward the book held in my left hand. Giving the envelope a gentle tap with my paintbrush opened it with a whimsical flourish, unlocking a new artistic element I could then paint on the walls. Over the course of my play session I unlocked trees, dandelions, even fire (no, it doesn’t set the grass or trees on fire — think more like a campfire). The more comfortable I became with my expanding toolset, the more options I unlocked to complement my work. 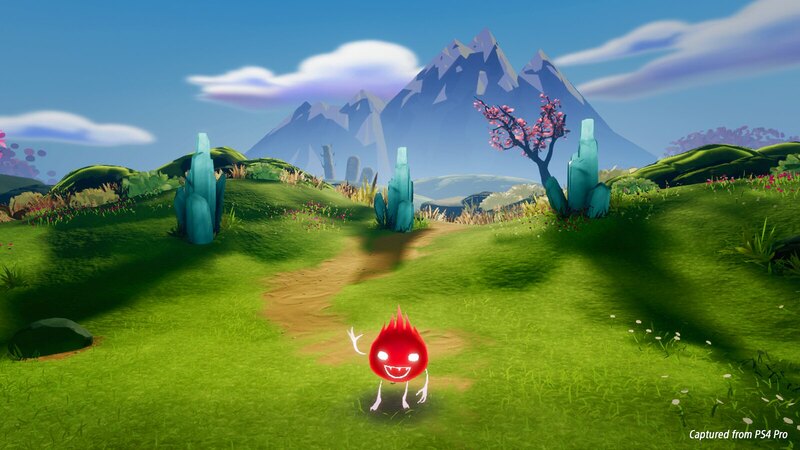 My guide throughout this experience was an adorable little sprite named Splotch, a fiery character with personality to spare. As I painted each room’s drab walls to life, Splotch interacted with elements of my artistry in amusing ways: blowing on bamboo shoots in an attempt to create music (you’re doing great, buddy), eating apples I placed on tree branches, and generally just being a mischievous little bugger. I love him. After painting enough to illuminate every light bulb in the no-longer-dreary room, something surprising happened: the wall in front of me cracked and broke, leading me into a new room where I used my newly expanded toolset to create a new piece. This happened a few times, easing me into an expanded set of tools. I was grateful for the gradual introduction to each new element in my kit, as I predict the full set would be rather intimidating if I had access to it all up front. Finally, after lighting up a few of these rooms, something incredible happened: the walls around me broke away entirely, giving way to a vibrant field where I was given free reign to paint in a fully 3D space (was I in the painting at this point?). Even Splotch was an actual creature now, rather than a painting on a wall! He trotted to and fro, collecting flowers I placed around the field and fashioning himself an adorable little floral headdress that we wore for the rest of the demo. Again, I love him. This sudden injection of color, a third dimension, and a general feeling of life to my work was almost overwhelming; the contrast to everything I had experienced thus far really accentuated the “wow” factor of the new world I inhabited. I’d wager anybody watching from outside the headset saw a nice, dumb grin on my face for most of this demo. Pixelopus has gone to great lengths to ensure even the most artistically challenged players can pick up a brush and create something beautiful. I’m not sure what kind of witchcraft they’ve baked in here, but even for an uncultured lug like me the act of painting felt graceful… even elegant. I found myself subconsciously getting into a sort of rhythm with it, channeling dramatic scenes of artists sweeping a paintbrush over a canvas in a creative frenzy, driven by some invisible force. And yes, despite my absolute lack of talent, everything I created looked gorgeous. Concrete Genie launches on PS4 this autumn with two PlayStation VR modes. Until then, I’m going to brush up with some Splotch fan art. The post Hands-on with Concrete Genie’s freshly revealed PS VR experience appeared first on PlayStation.Blog.Europe.